This study quantified variations within tree stems in tangential shrinkage (αT), radial shrinkage (αR), and tangential/radial shrinkage ratio (αT/αR) of Melia azedarach grown in two different sites in northern Vietnam. The overall values of αT, αR, and αT/αR were 7.05%, 4.38%, and 1.64, respectively. The variation pattern in αT and αR was found to increase gradually from pith to bark and this trend was similar on both sites. In radial direction, the αT/αR decreased significantly from 10 to 50% of the radial length from pith before approaching a constant value toward the outside. The transverse shrinkage variation with height was very small and without statistical significance. There were strong positive relationships between transverse shrinkage and basic density (BD). 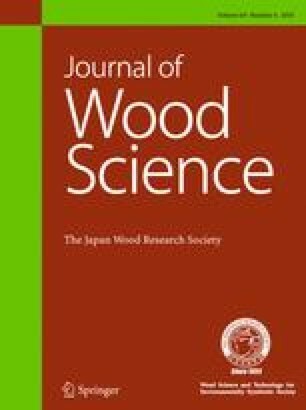 This implies that the selection for high wood density may lead to increase wood transverse shrinkage. In addition, the αT and αR had significant positive linear relationships with both acoustic wave velocity (VL) and dynamic modulus of elasticity of log (DMOElog). This result suggests that it might be possible to sort lumber with large transverse shrinkage by stress wave method for M. azedarach planted in northern Vietnam. The first author was funded by Vietnam government for a Doctor course at Graduate School of Bioresource and Bioenvironmental Sciences, Kyushu University, Fukuoka, Japan.